An amazing thing happened to Sanju Bhagat, a 36-year-old farmer living in a small village near Nagpur city in India. He had an unusually large stomach for as long as he could remember but because he was a very thin man; his odd complexion reminded everyone of a pregnant woman. According to the man’s own account all the neighbors used to laugh at his stomach’s size. Finally the belly had become so huge that the poor farmer could barely breathe, and the issue was no longer a cosmetic one. When the ambulance finally brought him to the hospital he was immediately sent to the operation room. The doctors assumed that what he had was a gigantic tumor and were very concerned about all sorts of complications during the operation. They were prepared for the worst as they set off to remove the malignant formation, and no one dared to imagine what kind of thing they would soon discover. As soon as the surgeon cut deeper into the belly, almost a bucket of liquid spilled out onto the surface. Then the extraordinary thing happened. The doctor placed his hand inside and announced that there were many bones. “First one limb came out, then another. Then a genitalia fragment, hair, limbs, jaws…” – recalls one of the surgeon’s assistants. Out of Sanju’s stomach came forth a weird half-formed creature with well-developed arms and legs and quite long nails. 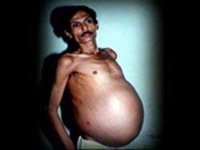 As it turned out Bhagat had one of the rarest medical anomaly: fetus in fetu, and the horrific-looking creature pulled out of him in actuality was a mutated body of his twin brother. According to the doctors’ reports there are only 90 known cases in the history of medicine when a twin sibling gets trapped by the second one and continues its development as a parasite. This tends to happen very early in pregnancy and usually both of the twins die before birth. In rare times, however, the twin survives with the other inside and goes on living while carrying and feeding an underdeveloped parasitical fetus through their shared umbilical chord. Usually there is medical intervention at the point when the parasite becomes so big that it causes harm to its host.